This is one of the original Kershaw Blurs, the Blurs that started it all. Like all Blurs it's equipped with a big, slightly recurved blade that's ideal for multitasking. The blade shape offers both excellent slicing and piercing capabilities and the high-performance Sandvik 14C28N stainless blade steel offers corrosion resistance and hardness. Like all Blurs it&apos;s equipped with a big, slightly recurved blade that&apos;s ideal for multitasking. The blade shape offers both excellent slicing and piercing capabilities and the high-performance Sandvik 14C28N stainless blade steel offers corrosion resistance and hardness. 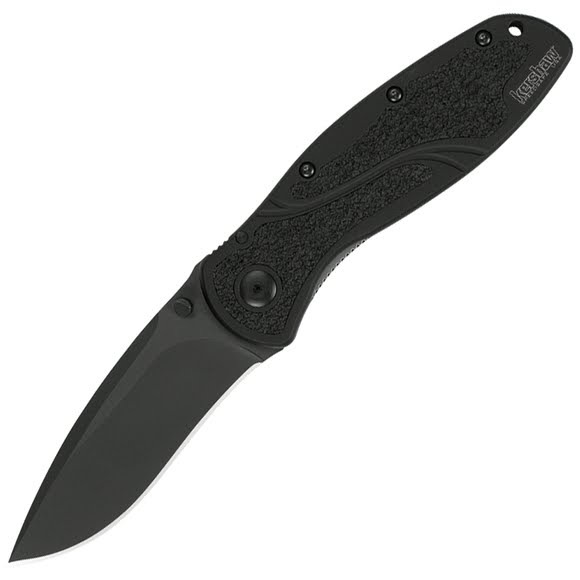 The black Blur has a DLC (Diamond-Like Carbon) coated blade for extra corrosion resistance and enhanced looks. This black Blur has, as you might expect, black handles with Trac-Tec grip-tape handle inserts for an extremely solid grip. The handle itself is durable 6061-T6 anodized aluminum, sometimes described as "aircraft aluminum" since it is a common material used for aircraft fittings. But the main point is that it&apos;s lightweight, extremely durable, and - when anodized - accepts a dye so we can create colored handles that are scratch resistant and extra tough. For easy one-handed opening, the Blur is equipped with SpeedSafe® assisted opening. A short push on the thumbstud overcomes the resistance built into the torsion bar in the SpeedSafe mechanism. The SpeedSafe takes over and the blade moves out of the handle quickly and easily. One-handed opening is easy with SpeedSafe. The pocketclip is reversible for your choice of tip-up or tip-down carry. There&apos;s even a pre-drilled lanyard hole. A strip of stainless steel is riveted inside the knife&apos;s handle - most commonly when the handle is a lightweight material. This enables us to create a slimmer, lighter knife, while still providing the strength and security of a locking liner.